Have you crunched into a crispy kale chip? So light and crispy they shatter and crumble in your mouth and have a salty earthy flavor that is a completely satisfying snack sensation. It’s rather astonishing how easy it would be to eat an entire bundle of kale once it’s baked into crispy chips and sprinkled with salt and maybe a touch of spice. I can’t fathom eating that much fresh kale, yet I must ration my kale chips to keep from devouring them in a single sitting. They are simple to make; a little rub of oil, dusting of salt, spread on a sheet pan and bake for 15 minutes. How can you not give this a try? In addition to the hightly desirable snack qualities of crispy and salty, baked kale has a sweet earthy flavor reminiscent of seaweed, but unlike seaweed it doesn’t get soggy and chewy when eaten. Nutmeg is a great spice with greens, so I added a touch after the chips came out of the oven. Good, but I really liked the batch I made with garam masala; the complexity of a blend of spices is more interesting. 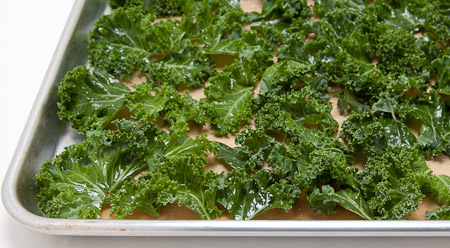 The sweet warm flavors of cinnamon, nutmeg, clove, and cardamom typically found in garam masalas are prefect with kale. 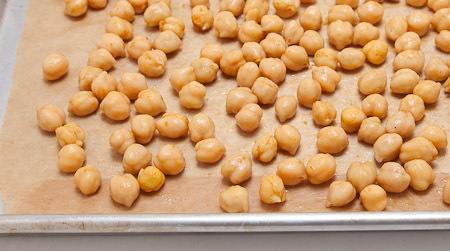 For a great snack duo, bake up some garbanzo beans while you’re at it. Right from a can these little nuggets are as easy to toast up as the kale, though it takes about 60-70 minutes to get them baked to a completely crispy state. Well worth the wait. Sprinkled with a bit of kosher salt and curry powder they too become an addictive little snack, and can pack a punch depending on how spicey your curry powder is. Sort of like corn nuts, only good for you. I have Jaden over at Steamy Kitchen to thank for putting this treat on my radar. I read about them on her blog and got up from my computer and headed right for the can of garbanzos stashed in the pantry. For some really creative flavor treatments check out the list of roasted garbanzo bean recipes the folks over at The Kitchn wrangled from across the web, or just turn to your own spice collection for inspiration. Both of these will be a hit if you serve them at your next party, or just keep them all for yourself as mid-afternoon nibble that’s packed with protein. I hope you’ll give them a try and let me know what you think. Now, if you want to swing to the complete opposite end of the snack spectrum, check out this blog I just came across, www.junkfoodblog.com. This entry was posted on Tuesday, August 17th, 2010 at 9:34 am	and is filed under Cooking on a budget, Nibbles and Snacks, Party Food. You can follow any responses to this entry through the RSS 2.0 feed. You can leave a response, or trackback from your own site. Great looking, healthy snacks! 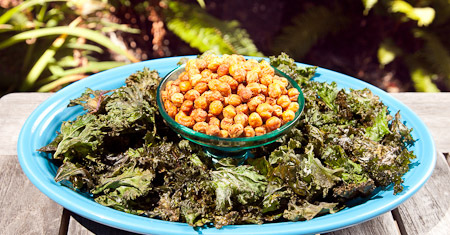 I’ve tried baked garbanzos, but not kale chips. I’m intrigued, though! I made another batch of kale chips today. They’re definitely my new favorite snack. This time I mixed a little apple cider vinegar with the olive oil and sea salt before tossing the kale with it. Pretty good. Jill – definitely give the kale chips a try. Really tasty. I often crumble them into green salads too. Patricia – I’ll try a little apple cider with my next batch. That sounds like it would add a nice tangy flavor.